I would love to take the credit for finding all the best pink destinations, but truth to be told the pink is finding me. I never make my own pink skies in Lightroom that don’t exist in real life. These places are truly pink that you’ll be able to see with a naked eye. Some call these places the ‘millennial pink’. I call them just pink spots since older generations enjoy them as much the millennials. Whatever your taste is, there’s something for every jetsetter. Salt lakes of Las Coloradas are naturally pink due to the amount of salt and red algae. These are the only pink lake that you can come to close, as Lake Hillier in Australia doesn’t have a passage to it and can only be seen from the air. My flamingo photo made Las Coloradas slightly too famous. Unfortunately, way too many tourists were trying to go there after the photo went viral, so walking or touching the water is now strictly forbidden. Police guarding the place will yell at you if you even get too close. You must have seen Pietro Nolita restaurant in photos from the fashion week. The place is quite small, but you can easily spot it by looking at girls posing in front it of. The majority of them though never get in for lunch, which is the biggest mistake one can ever make! This eco-friendly place offers a menu of just a few pasta and salad, but they’re all delicious. Waikiki beach in Oahu is full of big hotels with stunning ocean views, but there’s only one hotel that stands out there because it’s pink. Their beach umbrellas are pink, the building is pink, the rooms are pink – it’s a real pink paradise! If you search #pinkwall, Instagram instantly pulls up 69,669 pictures, about half of which are of the Paul Smith wall what makes it the most famous wall in LA. Don’t forget to check out Carrera Cafe across the street where you can print anything on your coffee. And pose with an old pink telephone. Scoring tickets to the Museum of Ice Cream pop-ups is a challenge. Trust me, I’ve done it. The place is full of pink and colorful exhibits, but the most popular is the pink pool of sprinkles. People don’t seem to get enough of Sketch, as it’s probably the most photogenic restaurant in London. Popular for its afternoon tea and late night drinks and dinners, the place has different themed rooms. As you can suspect, one of them is pink. P.S. Don’t forget to visit the toilets and do your business inside an egg! We can’t talk about pink places around the world and not mention the pinkiest animals on earth – flamingos. 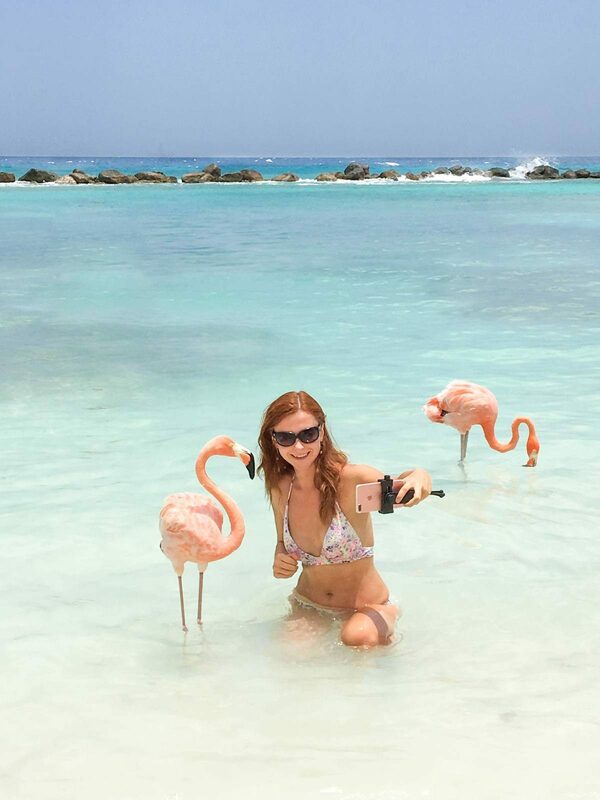 Renaissance Private Island is home to a few friendly flamingos that will pose for your photos (if they want to) and eat from your hand. If you go to Palm Springs and don’t take a photo of That Pink Door, it’s like you didn’t go. That Pink Door can be found at 1100 Sierra Way. Every year the entire country of Japan turns into a pink wonderland caused by cherry blossoms. I’ve been to Japan before but didn’t see anything blooming so going to try next year again. Cross your fingers for me. If you missed the cherry blossoms, you can also go see some pink fields at Takinoue Park. If you missed the cherry blossoms, but still want to find something pink, head to Hokkaido. Hokkaido is inhabited by straight fluffy white creatures, living among pink flower blossoms. Who said you can’t make a tennis court pink? Madonna Inn presents the perfect combination of sports and pink trend. On top of their pink tennis courts, the rooms there are to die for – each has a completely different decor. I can’t wait to go there and stay myself, but I’m seriously worried I’d spend a month there, just changing rooms every night. Jaipur is known as the pink city, but it all started with the terracotta color many of its buildings are painted in to symbolize hospitality. The Palace of the Winds, also known as The Hawa Mahal, is the most famous and oldest pink attraction in the old city. A pink mosque is not your typical pink place, but gorgeous. While I visited Iran, I didn’t get to Shiraz which I regret the most from my trip. Just look at this place and you’ll understand why. Pink castles do exist outside of fairy tales. One of them is in Scotland and it’s super cute. I wish I could live there. Another pink gem, this time a castle from Germany. Many of the beaches in the Bahamas have light pink sands due to the red coral in the water. You can find your original pink spot there. If you haven’t spotted Peggy Porschen’s cafe on your Instagram feed, you must be living under a rock. The pink entrance is beautifully decorated with flowers and extremely photogenic bike. But let’s not forget the cupcakes which the cafe is famous for. 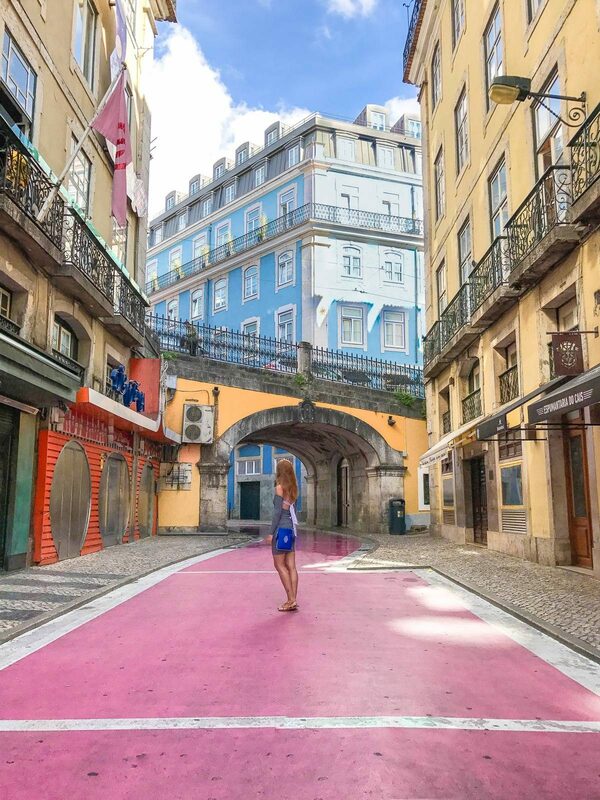 This striking building is an instagrammer’s pink paradise. The apartment complex in Spain is a labyrinthine structure painted in pale pink pops. Got inspired? 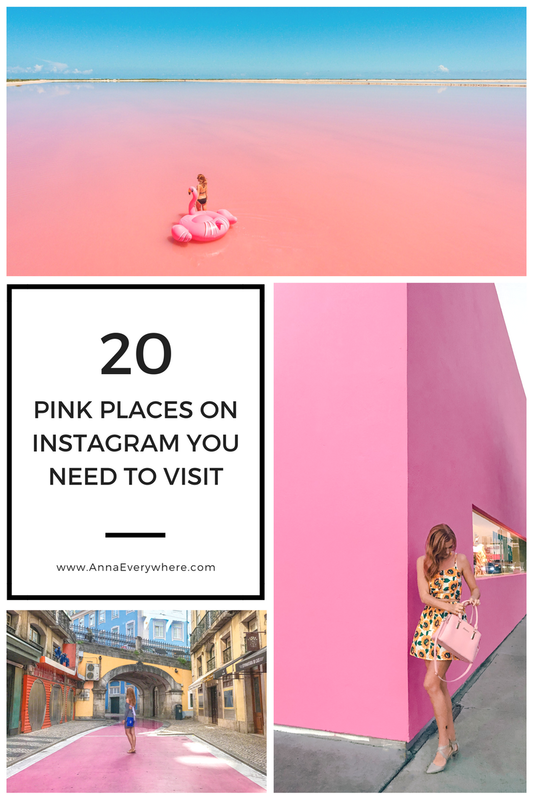 Or maybe you know some other pink destinations? Let me know in the comments below!